It was an experiment in seeing just how much could be removed from this story while still making it work. A few shots from The Lord of the Rings here and there. All the FE.org members that participated in my thread deserve much credit, especially everyone who previewed my workprint as I went along. - Azog is no longer following/hunting Thorin's company, but he is still one of the main villains. - Radaghast is removed until his scenes with Gandalf in DoS. - The White Council scene in Rivendell is removed, but they still rescue Gandalf later in the film. - Rock Giants are gone. - Goblin tunnels are heavily cut, but 99% of Gollum's scenes are kept. - Beorn is not in this film. - Most of Bilbo's struggling with how the Ring is changing him is gone, as it felt out of place in this story. - Tauriel is now just another elf, her relationship with Kili does not occur. - Legolas is heavily trimmed to be more of a fun cameo than a full fledged important character. - The Barrel sequence is much shorter, and the company is no longer chased by Elves or Orcs. - Bard's family and the politics of Lake Town have been completely removed. - Alfrid appears in some shots but has no lines of dialogue. - Dol Goldur is wrapped up before we meet Smaug for pacing reasons. - The Dwarves fight with Smaug inside Erebor is completely removed. - Smaug's attack on Lake Town is heavily edited. - Major cuts throughout Battle of the Five Armies to get the story moving and the pieces in place faster. - Major cuts to the battle for length and pacing. - "Misty Mountains" theme re-instated when Thorin rallies the army. - Kili's death rearranged to remove Tauriel. - Many cuts to Ravenhill for pacing. - The film features a new ending created using the various Old Bilbo shots and voice overs, shots from Lord of the Rings, and the delted "Dreaming of Bag End" music cue. This is, by far, the best way to watch The Hobbit. I'm a huge fan of the LotR Extended Editions and this is the perfect companion to incorporate into a binge watch. I'm glad that the extra material was left in rather than a straight book cut which I don't think was the issue with the films. But all of the bloat was taken out making this a rip roaring film. The only real issue in this edit is the battle of the five armies but, like previously mentioned by other reviewers, is an artifact of how messy the original cut of the battle was. I'm still surprised how cohesive this cut is and will probably never watch the originals ever again. A better title for this would be "The Peter Jackson Director's Cut." I've always felt a sympathy for Mr. Jackson, seeing as Guillermo Del Toro was given the privilege of three years to plan two films but him leaving the project screwed him over creatively. Jackson wanted the spent year and a half back, so he could trim the script down to ONE film, and make a film that was more in line with HIS vision than Guillermo Del Toros. The studio would not concede. He now did not have enough time to make two films one. He had a year and a half to storyboard, plan vfx, props, production design, and costumes for two whole 3 hour films. Guess what? He wasn't successful. He hardly finished much of the first half hour, and had to plan many of the shots on the fly. This is an insult to one of the most unique directors of our time, and its a scary notion that even a director as accomplished as HE could not achieve creative freedom. This edit very much honors him, with an edit that brings more focus on the character arcs that last from the beginning to end of the story, eliminating much of the unnecessary subplots that Guillermo added. It brings out many details one could previously miss when spread out across 3 whole movies, such as how Jackson brilliantly used every scene where Sting and the Ring are used as a motif to show how much Bilbo has evolved since the last time he used them. Such as how the scene where Bilbo encounters Smaug mirrors the scene where he encountered Gollum, again to show his evolution. Thus, the story evolves tonally and visually with the evolution of a character. Literally my only complaint for the entire edit was your decision to cut one scene which was an absolute necessity to the film; Gandalf smoking a pipe with Bilbo after the battle has ended. It perfectly reduces the massive scale of how much has changed, in terms of the story and the characters, to such a simple but beautiful shot. It calls back to the very first shot of the film in the case of your edit. However, your edit still works so well without it that I will not remove a star for it. It simply would have elevated your edit from magnificent to perfect. For anyone who was disappointed with the Hobbit, whether as a fan of the book or a casual viewer, this is definitely the best edit of this film which exists. Thank you, for preserving this director's vision, Spence. I had the crazy idea to watch the Hobbit again. The 10-hour trilogy movies are completely un-re-watchable to me, so I searched for a fanedit. 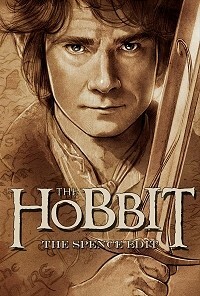 I tried watching the Maple Edit and the Bilbo Edition, both are 4-hour edits that try to stay close to the book. I dropped them both because in trying to keep true to book they keep too much silliness from Peter Jackson. There is a 2-Hour edit (!) that's actually very interesting but it's too rough and amateurish and it also tries to follow the book. Sadly, the way Peter Jackson made these movies, following only the book IMO produces bad results. The Spence Edit doesn't try to be true to the book, it just tries to make a good movie out of this bloated mess, and what do you know, it succeeds! There's actually a decent 3-hour movie in there that can act as a fine prequel to LOTR. I really like how Azog was handled and generally the parts of the movie that nod to LOTR and weren't in the original book. Most of the silly antics are gone. Thank God the whole pine-cone-grenades and Eagles scene was completely removed. Those frustratingly long and boring combat scenes in the last part were also thankfully trimmed quite a bit. Frankly the only scene I missed was this great idea I saw in the 2-hour edit that added the whole Misty Mountains song with scenes from Erebor's demise as a flashback. There's only one hiccup in the version I watched, the sound. The voices are just too low and especially in scenes where much is happening, they can become unintelligible. Something was probably lost with the transition from 5.1 to stereo. Aside from that this edit looks flawless. I can't say this is now truly a great movie, because I don't think P.Jackson's self-indulgent Hobbit trilogy can ever be a great movie, or movies, no matter how great the editing is. But this is the best take on the trilogy I've seen so far, a decent LOTR prequel and a fantastic fan-editing venture. The Hobbit movies all had a very The Phantom Menace kind of feel to me; overly campy and childish acts of self-indulgence on the part of a director who clearly wasn't told "no" a single time during its entire production. Despite my dislike of the theatrical releases however, I still held out some hope that they all could be edited into a more sensible and appropriate film. Sadly, I found the few cuts I found too campy to watch. While they were shorter, they still felt too cartoonish, too dense, and too aimless for me to watch it past the first half hour or so. With that, I pretty much gave up hope of ever enjoying The Hobbit movies. Then, on a whim, I decided to check out this version of the film. And to my great shock and surprise, this was it. This IS it. Spence does a tremendous job of cutting the film down to not just one feature, but realizing exactly what should and shouldn't be in a major motion picture and tailoring the story to those demands. It's tight, it's engaging, it's almost as serious as the original Lord of the Rings movies too. I was shocked by just how much he was able to cut - even down to the company of Dwarves getting far less exposure - yet never doing it at the cost of the plot or the story. In fact, for the first time, I actually felt a connection to these characters. I actually found myself caring about their journey, and I ended up watching 2 and a half hours of the movie without even noticing how much time had passed. While I've seen a lot of fan edits, and a lot of good ones, this one is probably my favorite yet because it took a series of movies that I found downright unwatchable and crafted and refined them into something that I not only enjoyed, but could easily sit through multiple viewings of. This is now my go-to-version of The Hobbit. So much more enjoyable than Peter Jackson's overly long version. Here we get Tolkien's single book in a single movie. Still long? Yes. Does it feel too long? No. The flow of the story is seamless, as are the video and audio editing. The one audio problem is that the volume is very low, you have to jack it up to hear all the dialog. Subtitles would help. If anyone made those, please share. Otherwise I may make the srt file myself.